We are excited to announce that Superior Manufacturing was named the recipient of North Dakota’s 2014 Exporter of the Year award. We received the award from the North Dakota Trade Office during the Global Business Awards ceremony. 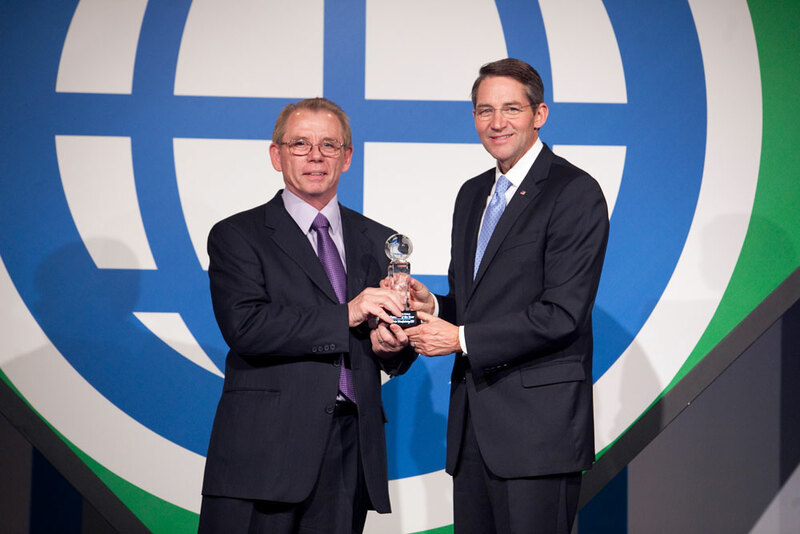 It’s a great honor to be recognized as the North Dakota international exporter of the year. We’ve worked hard to produce high-quality grain-handling and storage solutions to meet the needs of growers around the world. Our team is dedicated and knowledgeable in the farming industry, and we bring a Midwestern work ethic and drive focused on tackling grain storage challenges globally. Our company began exporting products globally in 2010, though our owner Claire Rauser got his start in the grain bin industry more than 30 years before that. He began pouring concrete for grain bin floors during his sophomore year at North Dakota State University in Fargo. After graduation, Rauser had a long, successful run as a grain bin dealer. In 2008, we began engineering and manufacturing our own line of grain storage, handling and conditioning equipment out of facilities in Beresford, South Dakota and Kindred, North Dakota. Grounded in our strong Midwest work ethic and armed with high-quality grain-storage equipment, we began developing our domestic and international dealer network in 2010. Our first U.S. dealers were in Minnesota, then Iowa and Indiana. Today, we have more than 100 dealers around the globe. Our global marketing efforts were jumpstarted with the assistance of the North Dakota Trade Office, which coordinated an international trip to Kazakhstan in Central Asia. While on our Kazakhstan trip, we saw the tremendous need for viable grain storage solutions and heard about losses of 30 percent of production post-harvest due to insufficient or poor storage. That eye-opening experience made us realize the global impact our grain bins and accessories can have on world food production. We’re continuing to grow our dealer network to service an ever-expanding international market. Our active international dealer network includes 10 countries, with new dealers starting in six additional countries. We attribute our network growth to participation in trade missions, as well as research and training through ExporTech™ and Gold Key Matching Service with the U.S. Commercial Service. Products we’ve sold internationally include grain dryers, commercial bins, farm bins and hopper bins along with bin accessories, such as unloads and sweeps, aeration equipment, towers, legs, conveyors, catwalks and temperature monitoring systems.